I am always looking for better ways to monitor things – from my home network, to our family cabin temperatures, to my sailboat. I have tried other vessel monitoring solutions, but they all had various issues ranging from cost, stability, and install time. 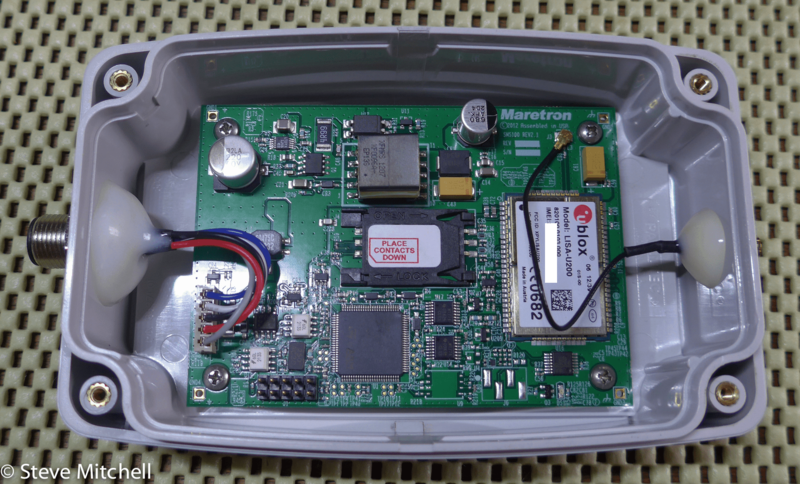 That’s why I was very happy to see Maretron come out with the SMS100 module. It’s an add-on to your NMEA 2000 network, along with at least one other Maretron product, that can send you alerts when various conditions change, and also allows you to interrogate it via text for a general update. In order to effectively use the SMS100 you will need either a DSM150/DSM250 display (I have a DSM250) or N2Kview software already on your network to configure and fire off the alerts. That last part is something that I didn’t anticipate, but makes sense. I had hoped to be able to program alerts with my DSM250 and then shut it off when I wasn’t at the boat, leaving the rest of my critical items on the N2K bus running, including the SMS100, but it has no event or alert logic within it – think of it as simply another alarm point such as an ALM100 or strobe. Besides one of the above, you’ll also need to supply your own SIM card with an active SMS/text messaging plan. 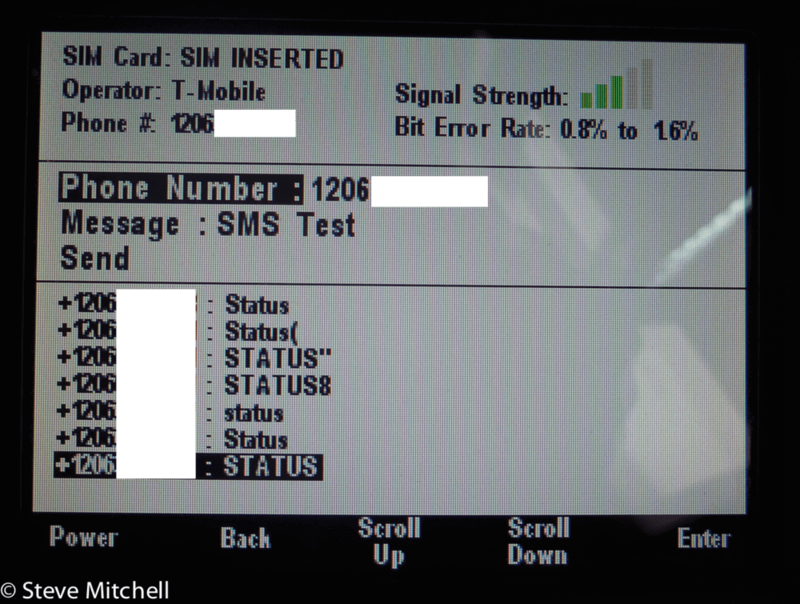 The SIM card itself is a 1FF or standard sized SIM. I used a SIM converter kit to upscale a Micro SIM to the correct size. I also used T-Mobile as my provider. The unit comes in a sturdy waterproof enclosure with a large antenna for the cell signal, and a NMEA 2000 port to connect it to your network. In the picture to the right you can see the small board with an ARM chip, a GSM/UMTS radio, the SIM card slot (almost right in the middle of the unit) and various other components. I was surprised at how large the overall box housing the board was – it’s much larger than I expected, and it could have easily been made to be at least 1/4 of the size. On a boat, where space is king, this is an odd choice by Maretron. Everything else I have from them has a very small footprint. If you have other modules from them such as the DCM100 or other standard sized sensors, this is much larger. Installation was super easy – add the SIM card, screw on the antenna, and connect to the NMEA 2000 bus. The rest was all done at the panel of my DSM250, which took the longest amount of time. 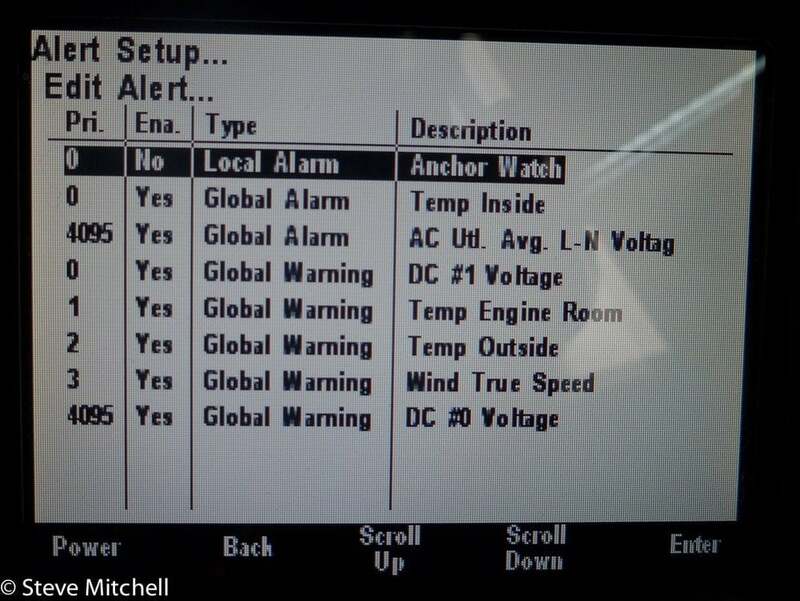 Setting up alerts and alarms requires a lot of patience to get each parameter right. 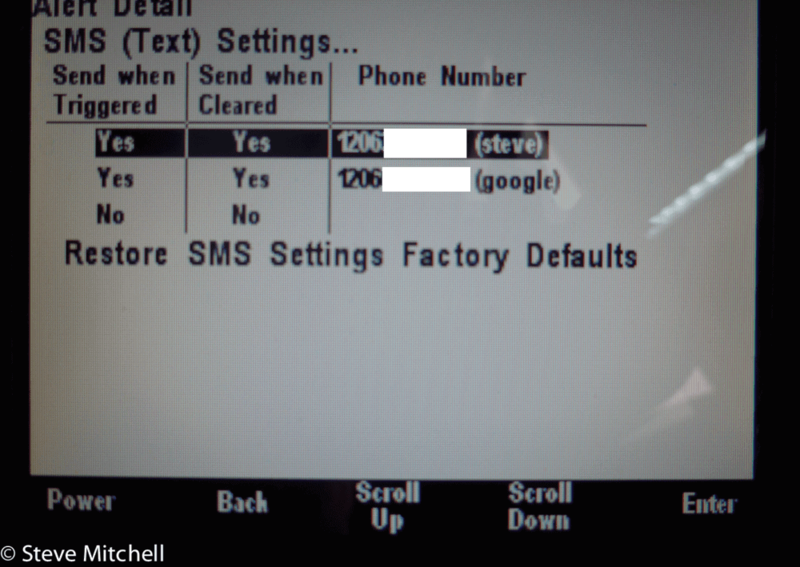 One of the main features of this unit is the ability to query it remotely via text message. 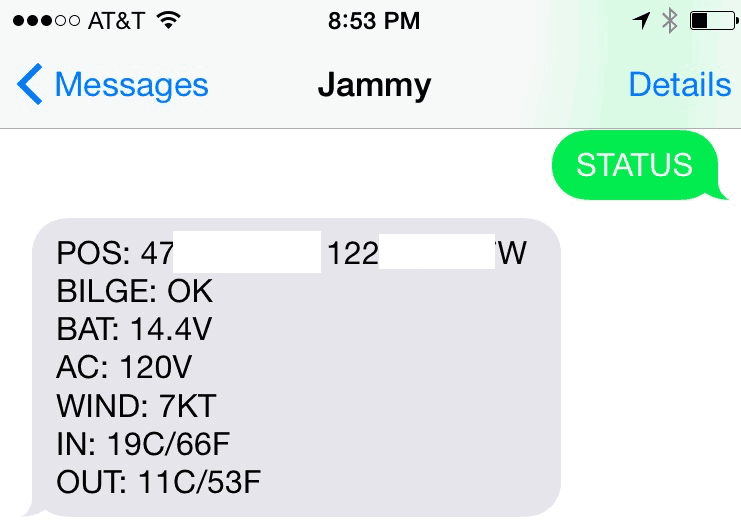 You can send the word “STATUS” to the phone number of the SMS 100 and it answers with position, bilge status, battery voltage, AC voltage, wind speed, and inside and outside temperature. Unfortunately, this part of the product seems to be buggy. I am only able to get it to reply to a status text about 1 times out of 5. Repeated attempts to contact Maretron support have not resulted in any resolution. I will update this post if I have more information. For now, sending four or five texts will get you a response eventually. Not the greatest solution, and a little worrisome when it doesn’t first respond. You can see some of the corrupted status texts in the picture to the right. For each of these, I had to define a particular low and high threshold, a name, what type of alert would be triggered, and select destinations for the alert (SMS, etc.). Once you do it a few times, it gets faster, but it still takes quite a while. I wish Maretron would expose this via the N2KAnalyzer program at least. You can use N2KView, but I have never been able to reliably get that Adobe Air (ahem) product to work, and even if you did, it’s just a remote display for the DSM. The same amount of keypresses are still required. 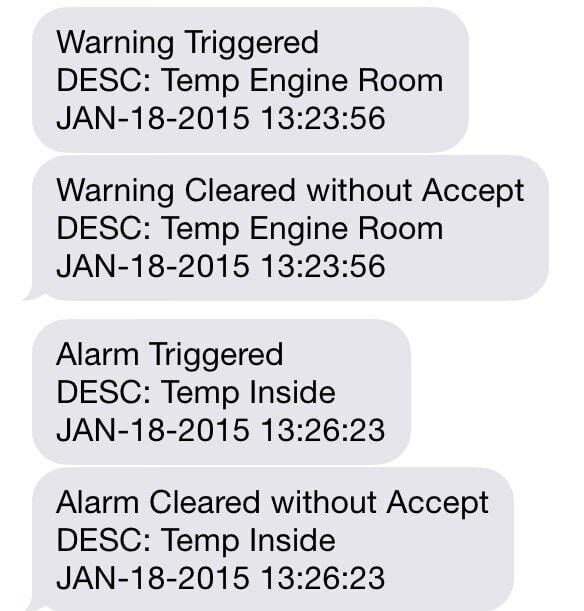 After install, I tested the alarms and alerts by causing failures – disconnecting batteries, AC power, blowing hot and cold on temp sensors, etc. All worked perfectly, and sent a text message almost immediately to my phone. I am worried given the issues with getting responses to status texts that in the event of a cell phone signal interruption, I won’t get an alert, but I have no way to reliably test this. I can also see this being useful while on overnight trips around the area. If I have to leave the boat at a moorage, I can put an anchor watch alarm on, and be aware if I’m away from the boat if someone is doing something nefarious. Overall it’s a great product when you consider it simply plugs into your NMEA 2000 network, instead of many of the 3rd party ones that require extra wiring and duplicate connections to the same thing you may already be monitoring. SignalK is an amazing new toolset to interact with your NMEA 2000 network.